Alshon Jeffery walks past the Saints’ Marshon Lattimore, Justin Hardee and Marcus Williams celebrating Lattimore’s first-quarter interception of Carson Wentz. NEW ORLEANS — This city has always been a lovely place for a funeral. The mourners acknowledge their grief, certainly, but then they celebrate the joys of a life well-lived. If you're lucky, you get a band. All the Eagles needed was a band. The Saints scored 17 points in the first 17 minutes, 53 seconds of Sunday's interment. The Eagles' season died a quick, comfortable death at 5:15 p.m. CST. They were buried three hours later, 48-7. They fell to 4-6. Four days early, these Birds are cooked. They just don't know it. 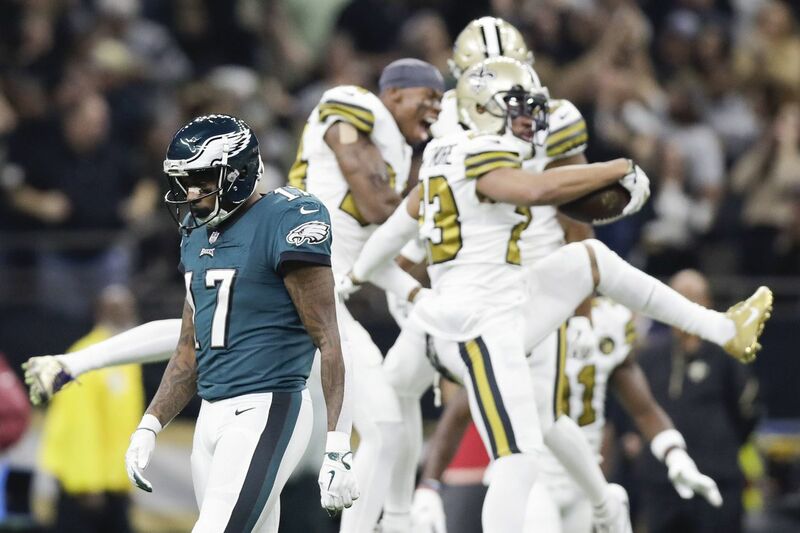 "The Saints beat the hell out of us," said receiver Alshon Jeffery, "but the division is wide-open for us." After a home loss to a decrepit Dallas team last week, and after this big, easy embarrassment, the Eagles have no realistic chance to play a single game in January, much less defend their first Super Bowl title. The math doesn't look awful, even with six games to play. They're only two games behind the Redskins, who on Sunday lost quarterback Alex Smith to a Theismann-like broken leg (33 years later, to the day), and also lost to the Texans. They're only a game behind the Cowboys, but after the Eagles resuscitated America's Team at Lincoln Financial Field on Sunday Night Football, the Cowboys went and won again, this time at Atlanta. Even the Giants won Sunday, over the Buccaneers, who beat the Eagles in Game 2. >> SOCIAL MEDIA ROUNDUP: What else happened around the NFC East? "We're not out of it, by any means," said tight end Zach Ertz. The Eagles face the Giants on Sunday. Who ya takin'? Sunday, in the fourth quarter and leading by 31 points, Payton went for it on fourth-and-6 from the Eagles' 37 — a 37-yard touchdown pass to Kamara, who burned — you guessed it — Jenkins. All seemed forgiven afterward. Payton said letting Jenkins walk as a free agent was the biggest mistake he's made in 13 years as head coach. It's easy to be gracious when you've just handed a team the largest defeat a Super Bowl champion ever suffered. It happened at the Superdome, where the decibel level tops out around 105, which is like playing football next to a table saw. It came at the hands of the highest-scoring offense in the NFL and the league's most efficient passer, Drew Brees. It was predictable, but still strikingly ugly. Brees had nothing to do with Carson Wentz underthrowing Nelson Agholor on the Eagles' third possession — a ball so badly delivered that Marshon Lattimore, the cornerback on the other side of the field, came all the way across to intercept it. Brees had nothing to do with Wentz taking his eye off the third-down snap that he bobbled, which ended the Eagles' first possession of the third quarter. That was all Wentz's fault. He played the worst game of his season when the Eagles needed him to be his best. He knew what was coming. But even his best would have been too little. Because, by the time the Saints finished their first three possessions — field goal, touchdown, touchdown — the Eagles had taken two more casualties. All-Pro center Jason Kelce's elbow and rookie safety Avonte Maddox's knee had called it a day, and maybe a season. That made seven projected frontline players who missed Sunday's game: running backs Jay Ajayi and Darren Sproles; defensive backs Rodney McLeod, Ronald Darby, and Jalen Mills; and receiver Mike Wallace. They then lost backup cornerback Rasul Douglas to a knee injury at the end of the third quarter, and linebacker Jordan Hicks to a knee injury in the fourth. That's just too much attrition. "Next man up" is only relevant when you have enough good men in waiting. Nobody has this many. To their credit, at the trade deadline the Eagles tried to replace Wallace with Golden Tate. To their discredit, they have largely ignored him. He has seven catches in his two games, but only four when the games were within reach. Some of those injured players might return. None will matter. It's over. Because, at this point, it isn't about divisional mathematics. It's about personnel. The team was built around tackles Lane Johnson and Jason Peters, but each played Sunday on a bad leg, and Peters' biceps is torn. And now, Kelce. The Eagles gambled that they had improved the defensive backfield, but the backfield is busted. They started Sunday's game without starters McLeod and Darby, whose knees are shredded, and Mills (foot injury). They finished it without Jones, who played a few snaps before his hamstring flared up again. They tried to compete with the unrelated Sullivans, Tre and Chandon, practice-squad projects now pressed into service, similar to Cre'Von LeBlanc, whom they claimed off waivers Nov. 5. They re-signed De'Vante Bausby, who was out of a job, to replace Darby. They've tried to get by with well-worn safety Corey Graham. They're not getting by. Consider: For the Saints' fourth touchdown, Michael Thomas ran from the 23-yard line straight to the left pylon. No moves. No trickery. On his way, Thomas sped past Douglas and arrived at the pylon the same time as the pass but just before Graham. This was made possible because Thomas is fast. Douglas and Graham are not. Doug Pederson did not appreciate the desperation of the situation. A reckless gambler of the first degree, Pederson instead played it safe at the end of the Eagles' first possession. He punted on fourth-and-1 from his own 24. He then punted on fourth-and-8 from the Saints' 49. The Saints replied with a field goal, then a touchdown. Neither of those was Pederson's worst moment. That came with 10:05 to play in the third quarter, the Eagles had to call timeout. They only had 10 men on the field.